In 2015, Australian business insolvencies are expected to increase slightly by 2% as economic growth slows down and the mining industry faces mounting troubles. Until 2014, the Australian mining industry experienced a remarkable upswing, due to the rapid urbanisation and industrialisation of emerging economies in Asia (especially China), which dramatically transformed global commodity markets. According to the Reserve Bank of Australia (RBA), investment spending by the Australian mining sector increased from 2% of GDP to 8% over the past decade. The mining boom raised real per capita household income by 13%, increased real wages by 6% and lowered the unemployment rate by more than 10%. However, at the same time the mining boom led to a large appreciation in the Australian dollar, which negatively affected other industries dependent on foreign trade, such as manufacturing and agriculture. Due mainly to lower demand from China, commodity prices have dropped significantly since early 2014. Metal prices have declined 14% since November 2014 and 44% compared to their 2011 peak. The decline in prices of iron ore and copper has been even more pronounced: 22% and 28% respectively. Also coal prices have shown a declining trend. Australian mining companies, especially those who entered the market at the top of the boom, began facing increasing troubles in 2014. As a consequence, there have been massive employee layoffs, huge write downs on assets and/or projects stalled or have been delayed. Exploration activities have basically come to a standstill. At the same time, related sectors like construction and businesses that are servicing the mining industry – such as small airlines that carry miners, restaurants, hospitality and food servicing companies are also feeling the pinch. Western Australia is already seriously affected by the consequences of the downturn as housing prices are declining, fewer people are dining out in restaurants and mining equipment traders are selling machinery at less than half of boom time prices. Due to the end of the commodity boom, Australian mining investment is expected to decrease further in 2015 and beyond, as current projects are completed and few new projects are commissioned. Resource companies are also continuing with their productivity drives to use their capital more efficiently, which along with lower exploration expenditure is expected to further weigh down capital spending on mining. Mining investment is forecast to decrease 25% in 2015-2016 and 30% in 2016-2017, cutting about 4% off GDP growth between 2015 and 2017. Due to the downturn in demand and prices, several mining companies decided to cease unprofitable operations or have gone into administration. In order to cope with the new situation, miners are busy cutting down their operational expenditures by further reducing staff, creating more efficiencies and deleverage their balance sheets. During the boom period mining contractors invested heavily in new equipment, but currently parts of this equipment do not generate income anymore while the loans taken for those investments have to be repaid. 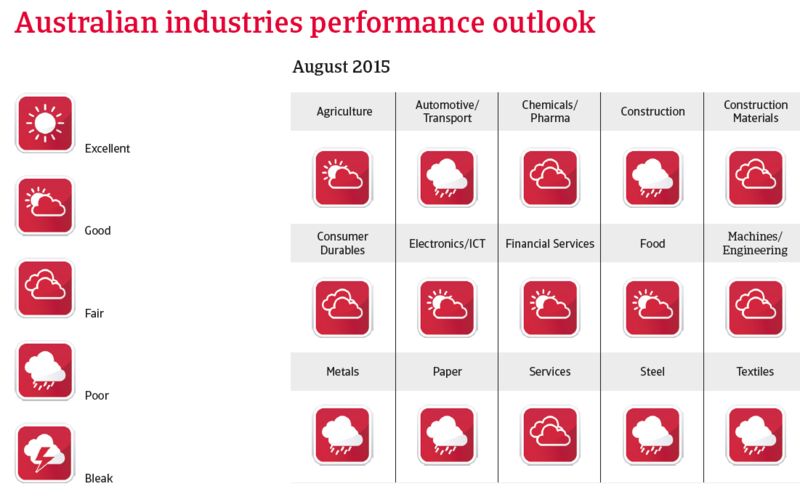 It seems that a large shake-out in this sector is underway, with only the big suppliers with world-class assets, high production volumes, high level of efficiency and low costs able to survive in the mid-term. Prices for iron ore and coal are expected to remain low in the coming years, as Chinese steel consumption is not expected to grow further due to existing overcapacities. At the same time, major mining companies do not show any signs of cutting production. Therefore, the imbalance between supply and demand is expected to remain. Some major mining companies even have increased their production levels in order to reach their revenue budgets and to defend market shares. 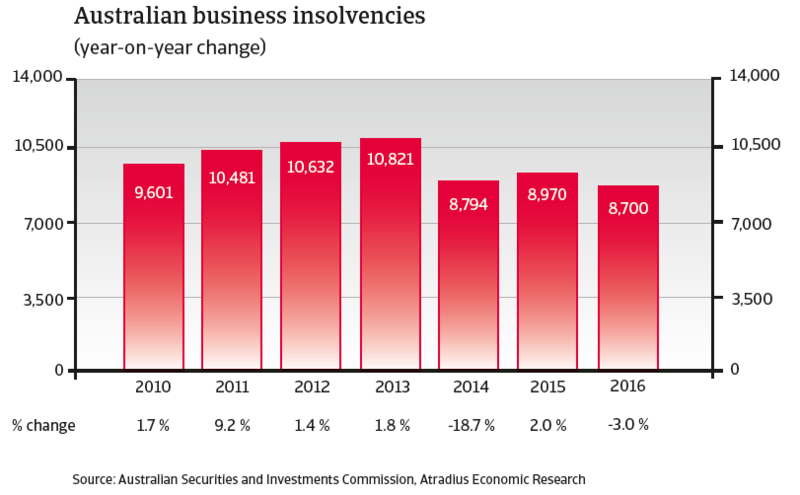 Business insolvencies increased sharply in 2008 and 2009, despite Australia largely managing to escape recession, and have remained at an historically high level between 2010 and 2013, before decreasing 18.7% in 2014. In 2015 it is expected that business insolvencies will level off or increase slightly, followed by an estimated 3% decrease in 2016. Despite a volatile global economy, compared to most advanced economies, Australia‘s economic performance has been remarkably good over the last few years. This was mainly due to the persisting mining investment boom, driven by high demand (especially from China), and high investment in the liquefied natural gas (LNG) related sectors. 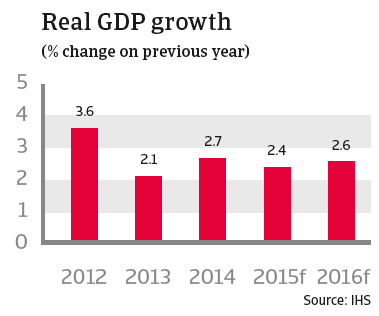 However, GDP growth slowed to 2.1% in 2013, compared to 3.6% in 2012, as the economy faced headwinds from the onset of a decline in both mining and non-mining investment, lower growth in consumer spending and the high Australian dollar. 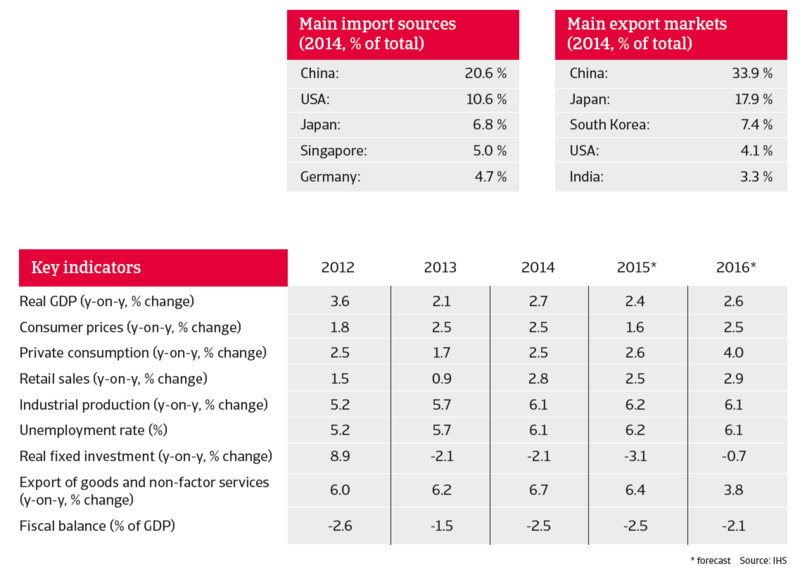 Mining investment decreased further in 2014, as major resource projects were completed. But housing activity strengthened as it benefited from low interest rates and a strong increase in house prices, particularly in Sydney. At the same time, consumer spending increased due to rising household income. 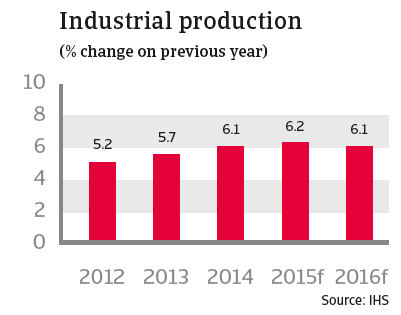 A major driver for Australian growth in 2014 was increased production volumes and export of bulk resource commodities, made possible by the heavy investment in production capacity in previous years. While increased bulk commodity exports are expected to continue in 2015 and 2016, their attribution to economic growth has declined as commodity prices have sharply decreased since June 2014. At the same time there is not enough momentum in consumer spending and non-mining business investment (which together account for two thirds of GDP) to return economic growth rates to the earlier trend: Australia´s GDP growth is expected to slow to 2.4% in 2015, followed by 2.6% in 2016. Low wage growth has been a major factor in dampening private consumption growth in 2013. However, household consumption growth picked up in 2014, to 2.5%, but nevertheless remained below its long-term average. Consumption grew faster than household incomes in 2014, as consumers viewed their financial situation as benign - despite the relatively weak growth in incomes. 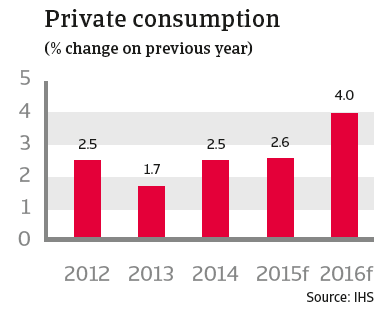 With modest wage growth in 2015 it is expected that private consumption will increase 2.6% in 2015. The Reserve Bank’s low interest rate monetary policy is supporting household consumption and housing construction in 2015. The already low benchmark interest rate of 2.5% held in 2014 was again lowered two times in the first half of 2015, to 2.0% - the lowest rate in 20 years. The Reserve Bank has indicated that this stance is likely to continue into next year, particularly as inflation is benign: Consumer prices inflation of 2.5% in 2014 is expected to decrease to 1.6% in 2015. Unemployment rose from 5.2% in 2012 to 6.1% in 2014, as the structural transition away from mining investment to mining exports has created an element of frictional unemployment that will take time to absorb. 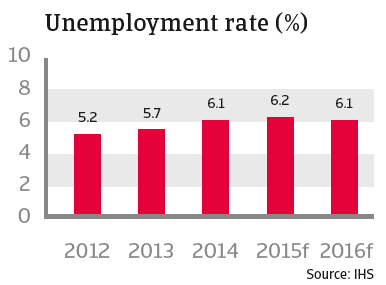 Unemployment is expected to remain at around 6.1% in 2015 and 2016. The mining sector has been the driver of high growth in real fixed investment -7.3% in 2011 and 8.9% in 2012, but mining investment reached its peak in late 2012. The pace of the decline is expected to accelerate as mega-LNG projects move towards completion, with mining investment expected to decrease by more than 20% in 2015. At the same time, non-mining business investment remains subdued, despite historically low interest rates. Many Australian companies perceive business conditions as satisfactory at the moment, but not sufficiently good enough to lift their investment plans. Uncertainty about the future economic and business development remains, and therefore many businesses are still deferring new capital expenditure until they see a sustained improvement in demand. On the other hand, residential housing investment grew strongly in 2014 and in the first half of 2015. However, despite this bright spot, real fixed investment decreased 2.1% in 2014, with declines in both mining and non-mining capital expenditure. 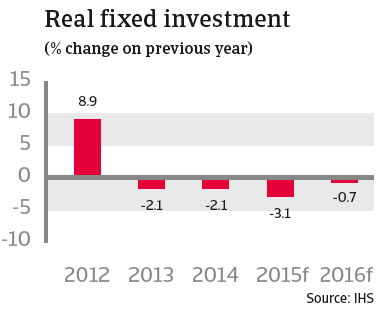 This downward trend is expected to continue in 2015 and 2016, with investment decreasing 3.1% and 0.7% respectively. A recovery in non-mining investment will be needed to deliver long-term and sustained economic growth in the post-mining boom transition phase. Despite the decrease in commodity prices, the Australian dollar exchange rate against the USD remained high in H1 of 2014, but finally started to depreciate in September 2014 - by about 20 % through July 2015. Due to the depreciation, tourism and other export-oriented industries in manufacturing and agriculture started to benefit. However, the current level of depreciation is still insufficient to achieve balanced growth, and a further depreciation seems to be both likely and necessary. When questioned about the biggest challenges to their business profitability this year, 36.2% of Australians responded that maintaining adequate cash flow was their key challenge.